If you pay attention to the news at all, you know the story of Oscar Grant who was killed by an Oakland transit police officer on New Year's Eve. Protesting and riots ensue over what appeared to be a gross act of misconduct that was all caught on video. 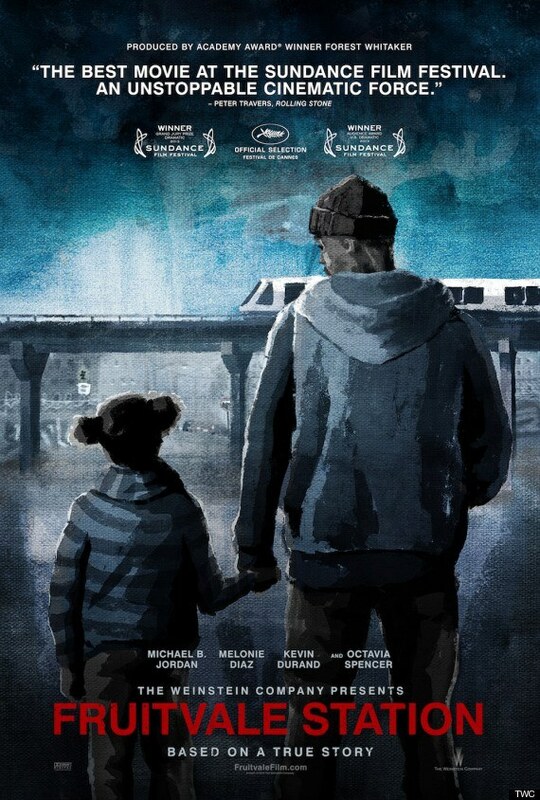 Fruitvale Station, written and directed by Ryan Coogler, is the story of that young man during the 24 hours leading up to a moment in time that will live in infamy forever. 22 year old Oscar Grant (Michael B Jordan) has recently seen his life come crashing down around him and has come to the realization that if he wants to save what he has left, then he needs to make some serious changes. 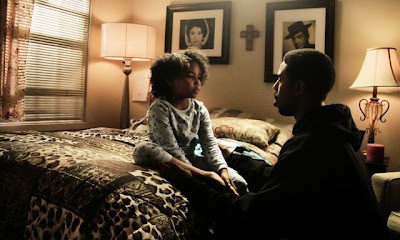 Leaving behind a life of unemployment, drug dealing, and spending time in jail in favor of being able to provide for his girlfriend Sophina (Melonie Diaz) and their daughter Tatiana (Ariana Neal) is what he hopes the future has in store. After a day filled with frustration, loss, and revelation, Oscar spends the waning hours of new year's eve at his mom's (Octavia Spencer) house for her birthday celebration. With the party winding down, Oscar and Sophina head out to meet up with friends for a trip into San Francisco on the light rail so they see the new year's celebration and fireworks. The night goes very well and everyone has had a great time, but on the way back home to Oakland, things will take a turn for the worse. 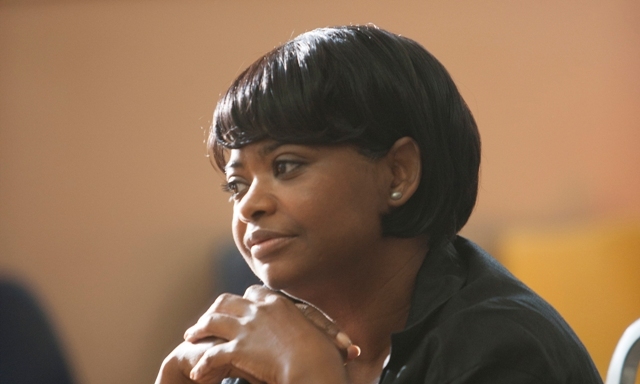 Every once in awhile, there is an actor or an actress that gives us a performance, like Octavia Spencer in The Help, that goes above and beyond what we ever expected from them. Michael B Jordan, in his portrayal of Oscar, has added his own name to that list and may end up with some awards consideration when the time comes. What sets him apart in this movie is how he manages to show the duality of a young man struggling to come to terms with who he has to become while leaving behind the immature kid he can't quite leave behind. As I mentioned before, if you know there story, you will know what to expect and Coogler knows this so he shows you the infamous cell phone video right off the bat. This is a very effective tool to both incite a level of emotion and to remind the audience why we are watching this story in the first place. After that moment of introduction into the final moments of Oscar's life, Coogler then takes us back to the previous morning and uses that entire day to show us who he was and where he was hopefully headed in life. The story is told in such a way that it breaks your heart even more after you realize exactly what was lost. 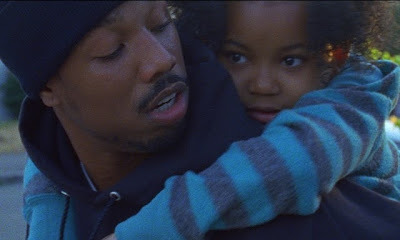 Given its controversial subject matter, Fruitvale Station is an important movie to get right and Coogler manages to succeed on every level. His ability to take you right into the middle of these people's lives defies the fact that this is the first feature film he has ever directed. Throw in performances from just about everyone in the cast that are as rich and believable as they are stunningly powerful and you get a movie that will leave you emotionally drained yet inspired to seek out a cause to get behind. Seriously, this is what good filmmaking is all about.